May 2006 -- Since last year, Johnson & Johnson has been running new 30-second U.S. television ads with the laudable goal of promoting nursing careers. These sentimental ads are part of the company's massive "Campaign for Nursing's Future" begun several years ago. Their theme is "the importance of a nurse's touch." In them we see caring young nurses helping patients ranging from a newborn to an older man. The spots are certainly well-produced. And they do include a few elements that suggest the nurses have some skill. But sadly, the ads rely mainly on the same kind of unhelpful angel and maternal imagery that infected the Campaign's original "Dare to Care" ads. And that era's four-minute Recruitment Video, complete with the gooey theme song, is still circulating. Of course "caring" is an important part of nursing. But everyone knows that, and we believe that only greater understanding that nurses actually save lives and improve patient outcomes will attract the resources nursing needs in the long term. For a great alternative ad, consider the wacky, infectious rap recruiting video (right) from 2004 by Craig Barton and the ED staff (right) at the University of Alabama at Birmingham. Fortunately, J&J has done more than disseminate troubling ads and videos. They have also financed a helpful nursing web site (which we helped to create) and raised funds for faculty fellowships and student scholarships. The company has also sponsored the longer 2004 recruiting video "Nurse Scientists: Committed to the Public Trust," apparently made for the Friends of the National Institute for Nursing Research. This helpful 11-minute video features nursing academics discussing their research in key areas like cancer, HIV, geriatrics, and domestic violence. It's not exactly going to enthrall the Total Request Live audience. But it tells the public that nurses can be scholars, and it may help address the faculty shortage that is hampering efforts to reduce the overall crisis. The original J&J "Recruitment Video"
Don't you want nurses to be caring and compassionate? Why does the angel and maternal imagery go on? The recent 30-second spots by J&J have much in common. All three feature the soft focus and high production values that have characterized the well-funded campaign from the start. All feature the same semi-cooing female narrator, the kind of voice used to advertise cuddly consumer products for babies. All have similar uplifting orchestral music, the kind that might support a prairie vista shot in a big-budget Hollywood film. All three open and close with voice-over (VO) lines linking the company to nurses. The opening: "At Johnson & Johnson, we understand the importance of a nurse's touch." (In one, it's just "touch.") The uniform closing for the ads, as we see the logo of the Campaign for Nursing's Future, is: "Nurses: we need you more than ever. A message of caring from Johnson & Johnson." The three ads feature four young "nurses" (it's not clear whether they are real nurses or actors). There are two white females, one African-American female, and one white man. We commend J&J for this diversity, which has been a hallmark of the company's Campaign. All four nurses appear in the first ad, while each of the other two ads features only one nurse (admittedly, the two white females). Not surprisingly, the first new ad is called "A Nurse's Touch." As the voice over talent delivers the initial "nurse's touch" line, we see scenes of four nurses. One is caring for an infant, using a stethoscope, seeming to caress the baby's head and asking if it feels good. Another tightens an older patient's blood pressure cuff and pushes a button on the attached machine. VO: "A nurse's touch...is skilled." We see another nurse listening with a monitor to a pregnant woman's belly, then passing the monitor to the woman's curious young daughter. VO: "A nurse's touch...is caring." The male nurse appears in an unmemorable scene in a clinical setting turning from one machine to another. VO: "A nurse's touch...can touch the world." Then, as the older patient's nurse fits her patient with headphones and softly says "enjoy," and the patient smiles, the VO concludes with the needing and caring line above. In the final shot, all four nurses step toward the camera. Obviously this is a positive and diverse vision of nursing, and we did note the fleeting reference to nurses being skilled. But nothing here looks all that "skilled." Even the visual accompanying that line is of the nurse pushing a button on the BP machine, which is unlikely to mean much to most viewers. Pretty much anyone can push a button. The basic message here is that nurses are kind, gentle hand-holders whose touch can touch the world in a touchingly touching display of touchability (that sentence used the word "touch" exactly the same number of times as the ad). This touching and caring vision is also the common vision of Mom. Besides the words, the visuals that are likely to stay with viewers are the headphone patient's smile, and the little monitor girl's look of wonder. One of the single-nurse ads is called "Baby Nurse." After the introductory "nurse's touch" voice over line, we see and hear from the neonatal nurse from the above ad: "Checking the baby and listening to his heart, and, you know, thinking maybe you don't hear something quite right, and alerting the doctor. I am one of the few people who knows what to do in that kind of situation." As we hear the nurse, we see her listen to a baby's heart with the stethoscope, and she seems to stroke the baby's head and face, presumably "checking" the baby. (VO): "A nurse's touch...can touch the world." We see the nurse holding and cooing at the baby, and letting the baby grab her finger. She says: "I know I make a difference. It's my niche in life. It's where I belong." The voice over concludes with the standard needing and caring line. Here again, this is a positive vision of nursing. And clearly those responsible were trying to put some focus on the nurse's unique skills with the "I am one of the few people who knows what to do" line. This is probably the strongest single line in the three ads. Sadly, any benefit the line might have is undermined by the clear suggestion that all the nurse can do if she does find a problem is to "alert the doctor." Of course that's one thing a nurse might do, but nurses take countless independent actions as a result of their judgments, many of which are life-saving. For instance, this nurse might have determined that the baby was not breathing (SIDS), and resuscitated him with ventilations and cardiac compressions. These empowering nursing interventions would do much to explain nursing autonomy, scientific knowledge and skill to the lay community. And one thing this nurse might "alert" a physician to is something that she had already done as part of her nursing care. But because the public knows little or none of this, it will likely have its handmaiden image of nursing reinforced: nurses matter because they are the ones who get the physician when something's wrong, and then the physician does something about it. The other things the "baby nurse" is doing may also send a troubling message. Of course all the baby interaction we see helps her assess the baby, and may aid the baby's development, but how many viewers will get that? Without explanation, they're going to see a female nurse cuddling a cute baby, and think, those angelic nurses "make a difference" by caring for babies, just like Mom. Is that really what career-seekers need to know about nurses? Will that motivate decision-makers to give nursing the resources they have not been giving it, because they never knew nurses did this kind of thing? The other single nurse ad is "Nurse/Jazz." It features more of the footage involving the nurse who is hooking the older patient up to an automatic blood pressure cuff. After the standard VO line, this nurse says: "How are you doing, Mr. Powell?" The patient (weakly): "OK." The nurse moves to examine him with a stethoscope, and says: "I just want you to breathe normally, OK?" As she's doing this, we and she see that the patient has photos indicating that he is a jazz trombonist. VO: "A nurse's touch can touch the world. Nurses: we need you more than ever." Meanwhile, the nurse puts a pair of headphones on the patient, saying: "Enjoy." He smiles gratefully. The ad ends with the "message of caring" line. Giving this patient the headphones is the kind of sensitive, patient-specific action a nurse would take, and it's one that could mean a lot to a patient. But again, does anyone not know that a nurse would do something like this? And without any explanation of how important a patient's morale can be to the ultimate outcome, will this seem important enough in the managed care era? The ad does show the nurse doing an assessment and using the BP technology, which most viewers will probably see as at least requiring some training. And although the ad's touching and caring elements will still likely be the main thing most viewers take away, this ad is probably the least aggressive of the three with the angel/mother imagery. Speaking of music, we're happy to report that none of the three newer J&J ads includes the "Dare to Care" song. But the song does live on in the original J&J "Recruitment Video" (4:00) from around 2002, which was still included on the DVD we received with the new ads. Suzanne Gordon offered a withering deconstruction of the "Dare to Care" imagery and song in her 2005 book "Nursing Against the Odds." Gordon showed that the materials were dominated by gendered, emotional angel imagery, and that they did little to tell the public why nurses are critical to patient outcomes. Of course, the Recruitment Video is not all bad. It does feature men and minorities, and plenty of strong general testimonials for nursing. Using somewhat less baby-oriented narration than the new ads, the video describes basic aspects of the profession today, relying on seemingly unscripted statements by articulate real nurses. There are even some positive elements in the voiceover script. These include statements that nurses are "educated," "intelligent" people who bring their own "special talents and expertise" to the "team." We hear that nursing is a "challenging" job requiring a "scientific mind, technological know-how, and a compassionate heart." The video also explains that nursing offers good pay and benefits, and a variety of specialties and practice settings. However, the long video offers few specifics as to what nurses really do to save lives and improve outcomes. The public already has a vague positive view of nursing. So broad, passing descriptions of nurses as "intelligent" and "scientific" probably won't add much without some demonstration of how that really plays out on the job. Instead of doing that, the video's main focus is the perceived emotional, "soft" quality of nursing. This starts with the "Dare to Care" song that runs throughout. The song is a sterile, faux-folkie number, sung by a high-voiced female and unlikely to appeal to many people under 40. (Yes, the tortured Karen Carpenter has been re-embraced in the current age of irony, but the bland "Dare to Care" song is unlikely to be seen as a cry for help from a talented woman trapped inside some repressive gender prison.) And the song's lyrics are a collection of angel images. We hear that nurses "dare to care." They "live for caring." They "have comfort to share." They "dare to cry." They "dare to feel." Similarly, the Recruiting Video voiceover informs us that nursing is "rewarding," that you can "touch lives" and "make a difference," and that "caring is the essence of nursing." Even the few specifics we get from the nurses tend to be along the lines of how nurses hold hands, give a good shot to scared children, get wrinkles out of a sheet that's causing discomfort, and rub backs. Of course these are important clinical actions. But we doubt ordinary viewers will know what difference they make in outcomes without any explanation, given the prevailing view that nursing is a largely unskilled custodial job. Of course caring and compassion are key parts of nursing. Sensitive emotional support is one of the most important things that nurses (and other health professionals) can provide to their patients. But few non-nurses know that "caring" also includes highly skilled, life-saving clinical judgments and actions. So just repeating words like "caring" and "touching" over and over, and pairing them with highly emotional imagery--but not with clear outcome-oriented specifics--will likely drive the angel and maternal stereotypes even deeper into the public consciousness. Nursing is often described solely in terms of tenderness, love, devotion and similar qualities. Thus, the profession is often associated with qualities that do not depend on years of college-level science education. The "angel of mercy" theme runs through everything from popular television to figurines, and many nurses themselves endorse this vision of the profession. As a result, much if not most of the public views nursing solely in those terms--not as the work of highly skilled professionals of both genders, but as a kind of paid mothering service, a place for females without other options. Of course, even the "emotional support" that nurses give is informed by their training and experience; it is not something that just any nice person could do. And emotional support can have real positive effects on health. But when nurses do it, it is less likely to be recognized as a professional skill. The reason we value a focus on the more technical, "harder" aspects of nursing--such as nurses' university training, advanced skills, and cutting-edge research--is that those are what the media and society tend to ignore. But they are critical to a full understanding of the value of nursing. Again, anyone can be compassionate, but not just anyone can be a nurse. 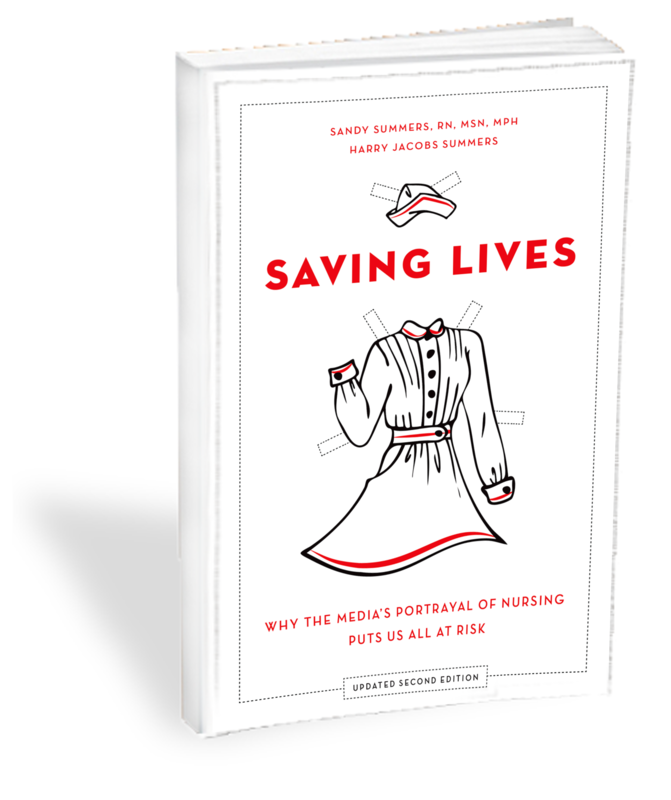 Suzanne Gordon has noted that, while she values nurses' emotional support, if given a choice between a compassionate nurse and a one whose skills could save her life, she would pretty much take the life-saver. It is this life-saving side of nursing that we feel the public and health care decision-makers really need to understand. So why does this go on? Why does Johnson & Johnson, a company that has been lionized in the nursing community for spending tens of millions on this campaign, go on distributing promotional products that reinforce the same angel, handmaiden, and maternal imagery that has helped create the crisis in the first place? Don't those responsible know nurses have college educations, and that they save plenty of lives with no physician involvement? Aren't they listening to the nurses they're trying to help? One possibility is that that J&J is listening to nurses, but J&J's advisors are nurses who disagree totally with our view of nursing. To the extent the company is going with its own instincts, or those of its ad consultants, it may be that they really believe the angel themes define nursing. It may also be that those responsible know there's more to nursing, but could not think of a way that seemed effective to promote it. Or they actually believe it would not be helpful to do so, perhaps because there would simply be too much cognitive dissonance if nurses were presented as authoritative, innovative professionals. Moreover, a major purpose of these ads, and the entire campaign, is obviously to promote the corporate image of J&J. The company clearly sees the benefit of inspiring love from the nursing community, and associating itself with the public image of nurses as trusted, ethical, and noble. But the imaging needs of a huge pharmaceutical corporation may not fit well with those of a group in crisis in large part because it is widely seen as consisting of nice, noble airheads. These ads may be a great way for J&J to tell the public that it is trustworthy and caring. But it's not clear to us that they do much for nursing. The public already feels that way about nursing, and look where we are. Sure, these soft-focus ads may attract some people to nursing. But we have to ask who is being attracted by what is more or less a big-budget presentation of angel and maternal imagery, and how long those entrants will stay at the bedside, if little is done to motivate decision-makers to provide the clinical resources and respect the profession needs to resolve the crisis in the long term. The job outlook is tough these days, but one job is in high demand--nursing. Did you know that well paying jobs for Registered Nurses are available in almost every city in America? But it's not just the job market that makes nursing a good career choice. As a nurse, you have the opportunity to save and improve lives, to teach people how to achieve better health, to advocate for patients to make sure they have the best health care, every day. Learn more about a career in nursing. Maybe it's because we wrote the italicized sentence for J&J, but we think this description of the actual work of nursing is very good, and we commend J&J for putting it front and center on their site. If only their TV ads reflected that focus on life-saving and advocacy! Not every element of J&J's video campaigns promotes a regressive nursing image. Along with our copy of the above video materials, we received "Nurse Scientists: Committed to the Public Trust." This is an 11-minute video from October 2004, apparently produced by the Friends of the National Institute for Nursing Research and "sponsored" by J&J. The promotional video features a series of talking head clips with about 10 U.S. nursing scholars discussing their research and its significance. The "nurse scientists" tell the public about some key things nurses do that most viewers probably never suspected. The scholars speak with authority and passion about their work, and they actually give some specifics, rather than just comments about "caring" or "helping." Their academic credentials and affiliations are displayed. Along with the expected white females, there is an African-American, a Latina, and a man. The scholars' focus on prevention and holism emerges. And we also get some sense of their technical prowess in areas that include geriatrics, HIV in minority populations, cardiac conditions, cancer, organ transplants, and violence against women. The domestic violence scholar says that nurses "have been on the front line" of addressing that problem. Toward the end, the participants make fairly direct pitches for increased funding for nursing. They argue that society needs nurses because they focus on deep and complex patient problems, issues on the "cutting edge." The scholars persuasively present funding for nursing as an investment in science. They are looking to the future, as they briefly discuss developments like the increasing reliance on home-based care and advanced technology. Finally, they urge potential nurses to come aboard, stressing that nursing does (contrary to current perceptions) allow students to realize their full potential. We did see a few issues with the scientists video. Some might find it a bit dry, as it is mostly talking heads, though you could also argue that if potential nurses can't handle 11 minutes of "scientists," they don't really belong in nursing. The video's initial text says: "Time was, the thought of nurses becoming scientists...was just a dream." VO: "This is a new day." We understand what they mean, but this seems to sell nursing a little short, perhaps suggesting to some that nurse scientists have just popped up in the last few years. By any measure, nurse "scientists" have been around for much longer than that--especially growing in numbers since the 1970's. And what about Florence Nightingale--not a "scientist?" There is also one unfortunate bit of angel/maternal imagery. Near the end, as part of the recruiting pitch, one scholar says: "We need the best minds in research, we need the best hearts in our clinical practices." Obviously, making this clean distinction between the research and clinical settings suggests that bedside nursing is about emotional support, not thinking. We're not shocked that a nursing academic would think this way, or even that it would slip out of her mouth. But it is distressing that the clip would get past all the many nurses we assume were involved with creating this video. Evidently no one with authority thought it might not be a great idea for a nursing leader to tell potential nurses and the world that the 5,000 nursing scholars mentioned use their brains, but over two million U.S. bedside nurses pretty much just use their hearts, as society has long believed. We applaud J&J for continuing to put significant resources into addressing the nursing crisis. We hope the company will show an equal commitment to ensuring that the messages it sends in its public communications actually advance that worthy goal. See our analysis on J&J's 2007 commercials, which were much improved over their 2005 commercials. The views expressed herein do not necessarily reflect those of the Board Members or Advisory Panel of The Truth About Nursing.